We charge a fair price for the level of service we provide. There are some ridiculously cheap company formation prices advertised on the internet, and much of the time this is because the customer is forced to buy other products along with their formation. We accept that we are not the cheapest company registration agents, but we do offer very good value for money. You need a service from people who have the experience, expertise and integrity to deal properly with your formation, and who are happy to answer your questions and get the service right for you. We register a wide variety of company types - many more than the majority of our competitors - and can provide bespoke advice on (for example) multiple classes of shares. See further our 'Why you should use us' page, and some testimonials from long-standing professional clients. Everything you need for a new company. We will check the proposed company name and report any potential problems to you, register the company electronically, with full details of the registered office, directors, company secretary and shareholders (as supplied by you) and provide a full company package on completion, including completed statutory registers (which are a legal requirement).This is not just an automatic on-line service. We examine every proposed company and will contact you if we have any queries or there appears to be a problem. If you do not require printed copies of the articles or statutory registers, our basic service may be sufficient. This service is really intended for solicitors and accountants who can supply the other essential parts of the package themselves. Most companies have only one class of shares - ordinary shares - but it is increasingly common for even very small private companies to have different share classes. This may be done for various reasons, such as to be able to vary the dividends paid to different shareholders, to create non-voting shares, shares for employees or family members, etc. A company can have whatever classes of shares it likes and can call any class of shares by whatever name it chooses. Apart from ordinary shares, common types are preference shares, non-voting shares, A shares, B shares, etc (sometimes called "alphabet shares"), shares with extra voting rights (sometimes called "management shares"). The share class system is infinitely flexible. Different classes of shares, and the rights attached to them, should be set out in the company's articles of association. We are one of the very few formation agents who are able to provide a full online service for those who wish to create companies with different classes of shares, and we can also provide bespoke solutions for those who wish to create more complex share structures. We offer a same day service (Monday to Friday, exc. public holidays) for all of our formations for an extra £50.00, including VAT and the extra Companies House same day fee. You can upgrade to the same day service during our online order process, and provided that there are no problems with the company details, the company is guaranteed to be incorporated prior to 6pm. In order to guarantee a same day service, we ask that all same day orders are submitted to us by 2pm at the latest. 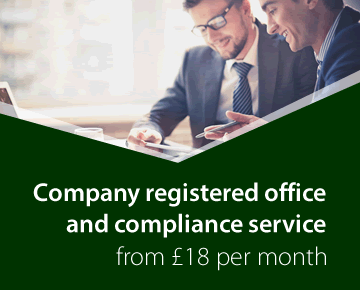 Combined secretary and registered office: £150.00 + £30.00 VAT = £180.00 (plus the confirmation statement fee of £13.00 and mail forwarding costs). These prices apply only where the owners of the company and their contact details are based in the UK. Contact us for details where the clients are based elsewhere. Incorporation Services Limited is part of the Company Law Solutions group of companies, experts in company law.